I decided to try out the Signature Edition version of the McIlroy Chardonnay (2012) from Costco with my Boudin pasta. The recipe for this is here. This time I forgot to buy shallots, but the finely chopped red onion I used instead was just fine. 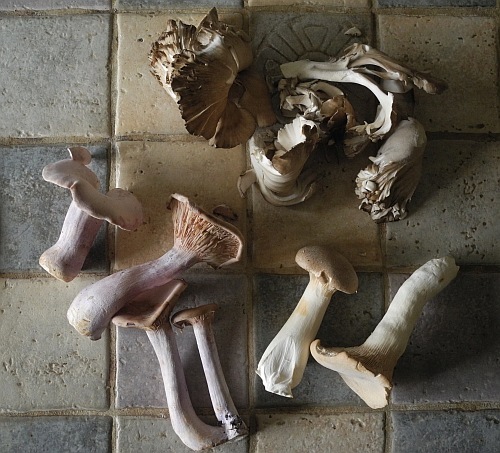 I used hen of the woods (maitake) and eryngii mushrooms. 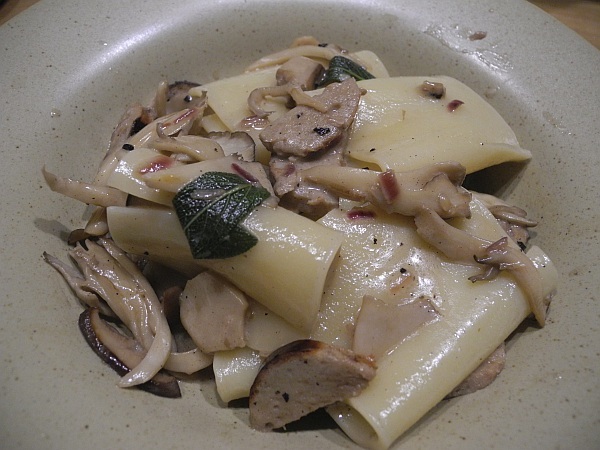 The photo also shows French bluefoot mushrooms, which I bought b/c they were amazing looking, but we decided to leave them out of this dish and cook on their own for pasta tomorrow, so we could see what they taste like. I sliced up about 2/3 of a zucchini and asked D to cook it while I finished off the pasta, which he did. He just cooked it in oil with salt and pepper, which is what I would have done, too. 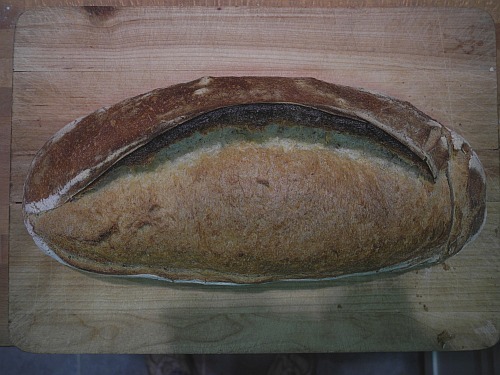 I bought a loaf of Acme Italian to have with this. I thought it was an especially pretty one. 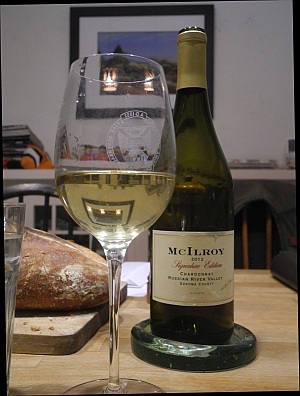 I opened both the 2012 Signature Edition and the previous 2014 “regular” McIlroy Chardonnays from Costco so we could compare them side by side, and we both liked the 2014 one better. The Signature was lighter, more delicate, but had less of the flavor I was looking for, the Chalk-Hill-like richness. D said the Signature was oakier, but I wouldn’t have said that. Maybe I don’t know what oaky tastes like. The 2014 was butterier. D wanted to use up the last of the vegetable curry over an omelette. 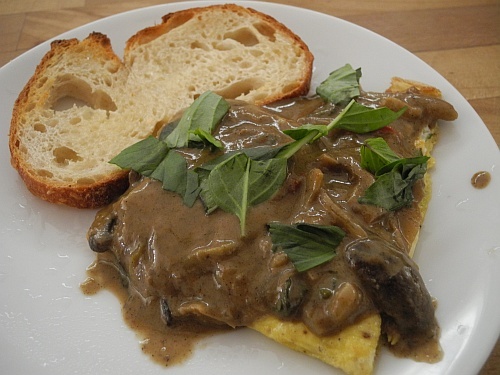 He made an especially pretty omelette – it folded in half perfectly – and then covered it entirely with curry so you can’t see how beautiful it was. He said this was the wrong omelette to have the curry on, since it was the best one he’d ever done 🙂 But it was yummy, anyway. He put some of the Thai basil over the top. We also had the Acme bread with this (as toast). 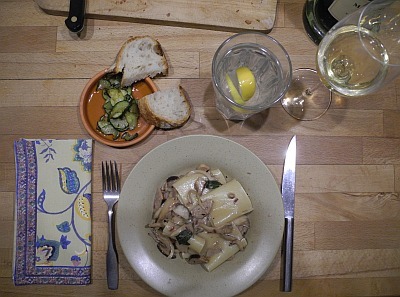 This entry was posted in Lunch, Mushrooms, Pasta, Sausage and tagged Acme Bread, Boudin Blanc, Chardonnay, Costco, Cream, Curry, Eryngii, Hen of the Woods, Leftovers, Lunch, Mushrooms, Pasta, Sausage, Zucchini. Bookmark the permalink.